There are two quite different heaven (time of Era) for all of humanity to live in, to survive in, to exist in. It is called the Early Heaven and the Later Heaven. 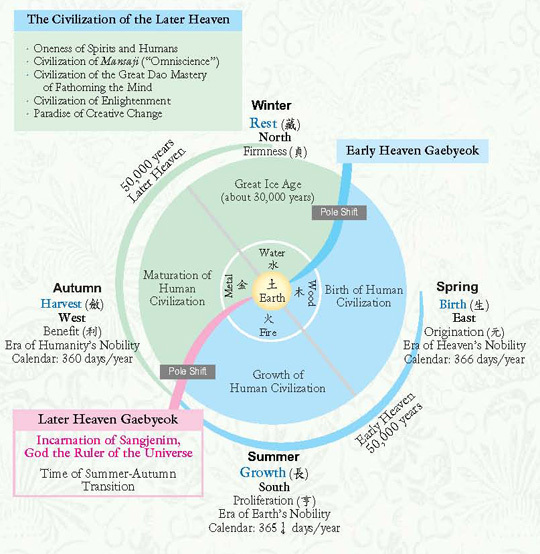 The Early Heaven is the first half of the 129,600-year cosmic cycle, the cosmic spring and summer, an era characterized by birth and growth, yang (male) dominance, diversity, and conflict. We are living in the time of transitional zone, from the Early Heaven to the Later Heaven.